and very, very, importantly SUPPORTED by community members!!! All sponsorship and patronage funds go directly towards making this festival a reality for everyone. Funding pays for everything that goes into creating and executing events during the festival (music, exhibitions, collaborations with local business owners, etc. ), materials and equipment for each mural, artist expenses (meals, travel, room & board, etc. ), as well as the nitty-gritty behind-the-scenes stuff! to see what you can contribute today! Thank you!! *Please email us or submit the form at the bottom of this page to receive a list of available artists for patronage! **If you have/own a building we will work with you and the artists to find the best fit but, unfortunately, all walls are not created equal. 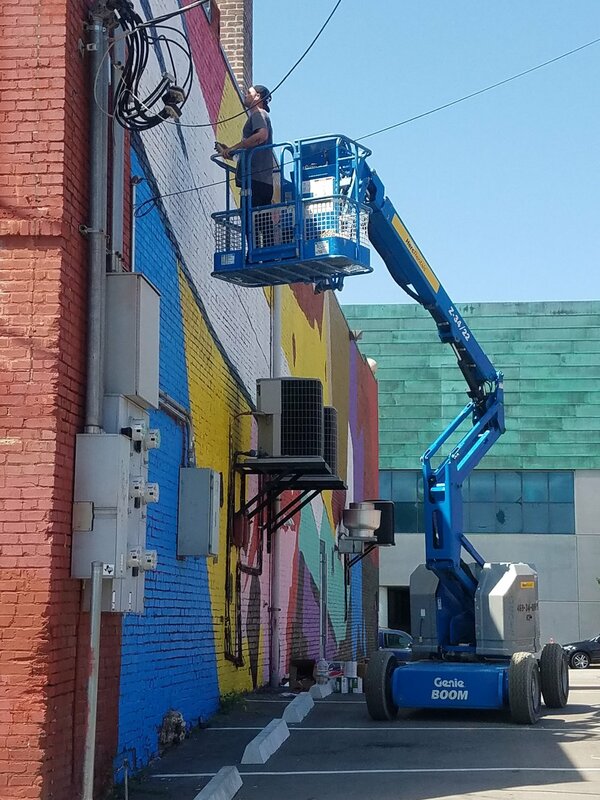 Sponsoring a particular artist does NOT guarantee that they will be the one to paint a mural on your building. Please contact us with any questions!! -We are seeking the donation of walls, services such as providing meals to participating artists, and individuals to volunteer their time during the festival. -Contributors will receive the same benefits as the above sponsor levels based on monetary equivalent of goods and/or services.